I know it's kind of a cliche but these things still creep me out, I blame the trailer for "Magic" and the fact that most magic shops had weird "Haunted House" lighting. Also, I see Lester all the time but how come nobody made a Chuck from "Soap"? 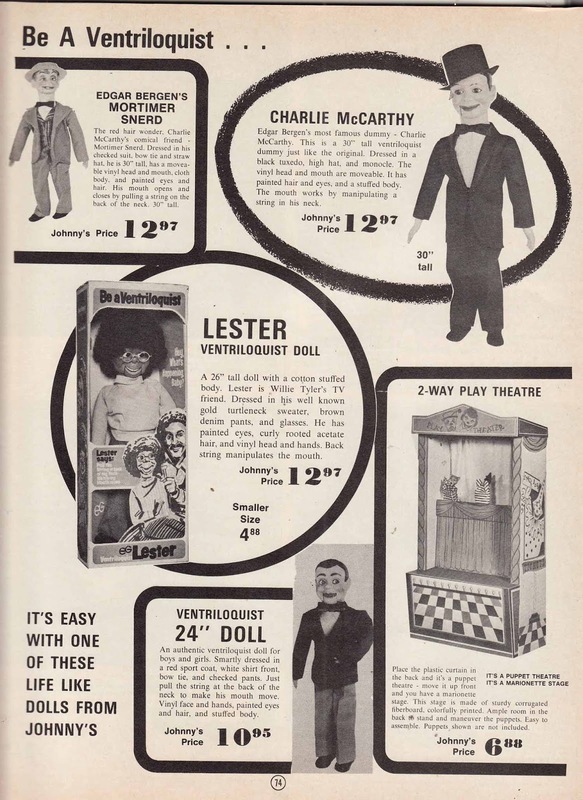 At one time, 70s or 80s I think, one of the department store toy catalogs offered Laurel and Hardy dummies. Struck me as a dumb idea, since the boys are hard to imitate well even with your lips moving. And an act with just one would be lame; you'd need a partner with the other dummy. But stranger still, the same outfit had a Charlie Chaplin Tramp dummy. Since the likeness had to be licensed, one wonders if anybody along the line raised the point that the Tramp never spoke ("The Great Dictator" doesn't count, since he wasn't really doing the Tramp). Fear should not shame a man. There is no shame in listening to your animal-totem when it warns you about something evil. Billy Jack taught me that. Seriously, ventriloquist puppets are bad news. Even Anton Szandor LaVey, founder of the Church Of Satan, didn't like them one bit. The man owned mummified human heads, built an entire "Tourist Trap" style bar in his basement but he drew the line at those dummies. LaVey hung out with those old vaudeville entertainers and from as much as he hinted at, "Magic" style breakdowns and personality take-overs were frighteningly commonplace. I'm a ventriloquist, and I think most of us alive at the time were inspired by these (many of which are still manufactured today). My first one was Jimmy Nelson's Danny O'Day, and then I received Willie Tyler's Lester. By the way, the dummy from Soap is Bob, Chuck was the ventriloquist (portrayed by Jay Johnson)! I was at a comedy club a couple of months ago. After the three acts we getting ready to pay our tab and leave when the lights went back down and a video came up on the screen extolling the virtues of Willie Tyler. I was literally frozen with fear when that little Lester came out on the stage. I was close to the stage and he (Lester) kept looking right at me. (I have goosebumps NOW!) Nothing against Willie Tyler, but it was the most horrifying experience of my life.